Club Penguin Cheats by Mimo777 Club Penguin Cheats by Mimo777: Club Penguin Recyclen? Wassup with dat? I was checkin my Club Penguin mail for my October pay checks and noticed something strange. Check it out. Did you notice this to? 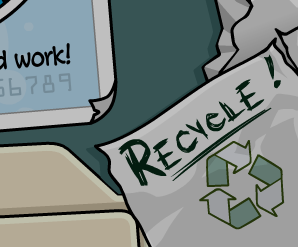 Why do you think Club Penguin made this change? Could it just be another one of their bugs? I think its's abug, maybe "recyclen" is "recycle" in another language? I've heard that people are seeing some of the writing in CP in German. Maybe a different language? i had a similar issue with my igloo. Maybe it's slang for the plural? i think its supose to say "recycling"
maybe it means "put to recycle plant"
Recyclen is Dutch for Recycle. Dutch being Holland (Netherlands) I believe. Did anyone notice how the top picture is darker then the bottom picture ? I wonder why ? recyclen means recycling in Dutch. Mimo it says Recycle IN. Not a bug.Just an update. :) Pups2003 P.S Im repeating my comment cuz the other comment I send was on my 3DS so im not sure it went in. 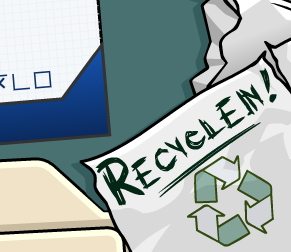 Recyclen is Dutch for recycling. Club Penguin is making another language so that more people can come and that language is German! It really is! Have you noticed that in your stamp book, in some pictures, the penguin change to the color you're wearing? a cool cheat here. In your igloo you put in the gutair amp and put it out of yoyr igloo ready for the inventory, you can see the records inside it! Cool huh? Today i was saving my password and it asked me if anybody else used this computer, but it still reminded me? It's German because I went on Google Translate to find out if it was German and it translates into recyceln. a translator online says it is German for recycle. it's in german and means a new language will be aded to club penguin. It's German for recycle. They must be so tired from work that they didn't notice it. My recycle button is fine. But if you go into an igloo your penguin looks HUGE!